With the emergence of digital marketing, there has been a huge shift in the way that companies need to approach and execute their marketing strategies. Over the past 5 years, there has been an explosion in the marketing technology landscape with only 100 vendors servicing this market in 2011, rising to nearly 2,000 vendors in 2015. You are likely familiar with popular automation solutions like Act-On, ClickDimensions, Hubspot, Marketo, Pardot, and many others. This has created an abundance of resources and options. It also has resulted in marketing departments now operating a variety of disconnected systems and leaving many companies unsure of where to even begin. Companies continue to experience the misalignment between marketing and sales departments. However, the emergence of marketing automation systems now offers marketing teams greater visibility into their campaign performance, the ability to nurture and qualify leads before passing them to the sales team as well as the ability to share customer activity. The key to closing that gap is the integration of marketing technologies to your CRM system. The alignment of data will allow marketing to pass qualified and comprehensive lead profiles to the sales teams and the sales team to push sales data back to the marketing team. It’s pretty cool the results you can produce when the right hand knows what the left is doing. That is where Ledgeview Partners’ certified marketing automation and CRM specialists really shine. Providing an analysis of current state and future state for marketing technology execution including the use and integration of marketing automation technology and CRM. Delivering an agnostic approach to help you select a solution that is in alignment with your business goals. Defining desired integration points between marketing technology and CRM. Marketing automation & CRM design and configuration services. Integration with your CRM system to create a 360 view of lead, prospect & customer activity. Aligning sales and marketing communications through CRM. Development of business processes and road map for execution of technology. Contact us today to learn more about Ledgeview’s Marketing Services. Marketing Automation vs CRM: What’s the Difference? 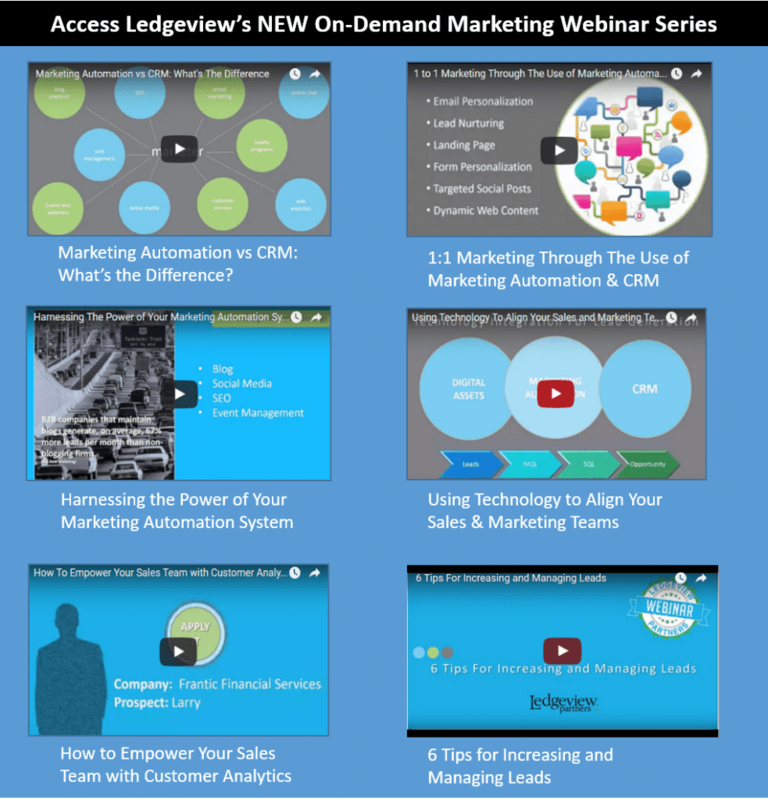 Ledgeview Partners is proud to represent Act-On and ClickDimensions marketing automation solutions. Interested in a demonstration? Contact us and we would be happy to set that up!